We’re always happy to talk about the fun new arrivals at KKH, but this week we’re especially excited to celebrate a woman who inspires us both as a designer and as a businesswoman. Meet Kelly Hoppen. She’s the design mind behind our simply GORGEOUS Kelly Hoppen collection. Since the age of 16, Hoppen has held a relentless passion for design and has grown to become one of the most celebrated names in the industry, renowned for her unparalleled expertise in a textural East meets West aesthetic. We were ecstatic at the opportunity to sit with Kelly Hoppen and listen in on some tips for how to get her signature style. Enjoy! Your “Kelly Hoppen look” is well known by the interior design community: a neutral palette with gorgeous textures and simple, elegant designs. How has your style evolved over time, and what has been inspiring you the most lately? For the last 40 years I have been known for my love of neutral color palettes. It is central to my design philosophy which always results in fantastically elegant and timeless spaces. I do love to complement this with great accents of color which can also transform a room. My designs fuse together the eastern principles of simplicity and the western taste for sumptuous textures and luxurious finishes. However, in recent years, I have also started designing some brightly- colored and bold products such as my cubes. If someone wants the “Kelly Hoppen” signature look, what are some design tips or guidelines they might follow? Bring the outdoors in. Using organic products, such as plants, flowers or succulents within your decorating can instantly brighten a room as it creates a real fresh, summery vibe – it can really blur that line between indoor and outdoor space. It’s also the perfect way to inject some color into your space without having to commit to any specific furniture pieces. Don’t over accessorize. Trends will always fade, so it’s incredibly important to really consider the pieces that you are putting in your home. My style is timeless and that is the sense that I create within every single project that I take on. When designing your home, invest in pieces that you love, rather than just purchasing something that is ‘In’ at the moment. Comfort is key. Your home should be your sanctuary, so comfort should be your number one focus. When creating a haven for someone in their own home, I love bright, open spaces, with beautiful crisp linens and neutral toned furniture. Find what brings you a sense of serenity and security and incorporate that into your interior; it’s all about finding that harmony between style and comfort. How would you describe your design process? What is your starting point, and what steps do you take to reach the final product? My brain has always worked on a grid scheme with shapes and clean lines since I was small. As I walk into a new space, my mind automatically builds a grid system and I can see a potential design almost instantaneously – a system that has always worked for me personally. I also make a point of getting to know my client, in order to understand how they live and what makes them, then I visualize the room and it all just happens. How do you balance your clients’ needs, requests, and preferences with your own design aesthetic? When I am designing for my clients, I get to know them well so that I can understand how they live within the space. A home must, at the end of the day, suit your lifestyle perfectly so it is very important to ask all the right questions and then couture the space to them like a beautiful dress. But people know my style when they take me on. I obviously adapt it to my clients’ lives, but my design philosophy and basic methodology tend to remain the same. Tell us about your first interior design project. What was it? How did you get it? How did it go? Even as a child, my mother said I was constantly shifting furniture around our home and displaying everything at its best. As I got older, I started looking around show houses, they’re a great opportunity to see design in action, as well as visualizing how the designers expect their clients to live within the space. But I began properly when I was 16, and my father’s friend asked me to design his kitchen. It was my first assignment and I haven’t looked back since. The passion grew stronger and the projects bigger! Let’s talk about your collection. What is it like to design your own line of furniture and décor? What is your inspiration? The whole process is exciting! I am finally able to have free reign whilst creating exactly what I wanted and had always wanted to find. Suddenly, where nothing is impossible, I can be surrounded by the most incredible materials and textures and can my mind run free with designing my dream products! There are no limitations. What is the most challenging aspect of designing furniture? Balance is so important when designing furniture. It all needs to be super comfortable but also aesthetically beautiful with a simple design. Finding harmony between style and comfort is key. Also, little details such as finishes and materials are important. What makes your Kelly Hoppen pieces unique? What do they bring to the home? I am inspired by my travels, especially the markets and flea markets that I have explored throughout the world during my 40 years in the industry. I use the absolute best materials and teams to make my furniture and each collection is a testament to my aesthetic belief in using modern clean lines, but combining them with an eastern design philosophy. I also try to ensure that through the designs available, every user will be able to adapt their furniture to reflect their own style. What is something that every home should have? A home must be a timeless and harmonious environment that suits the person’s lifestyle and that of their family and friends. How would you define the word home? What does it mean to you? A home is a place to rebalance your body and soul. You must feel at ease and at one. I am somebody that defines a space by the people that live in it. As a designer, I define the space so that your art can speak in a room. I create layers of texture, whether it’s lighting (which I conceptualize of as a texture); fabrics; stone; the colour of the walls; the way the sound feels in a space; the way the food smells in a kitchen. You know, it’s all about finding that balance in a home and that is very important to me. It’s about sensual interiors, because it’s all about the senses. What advice would you give your younger self as a burgeoning interior designer and business woman? Do your research, know your market and your unique selling proposition and be credible. If you have a dream, chase it. Stick to your vision, be creatively inspired by everything around and follow your gut. Most importantly, have self-belief. If you don’t have faith in your project or yourself, how will anybody else? If you have confidence in your ability and designs, paired with determination, you’ll go far! 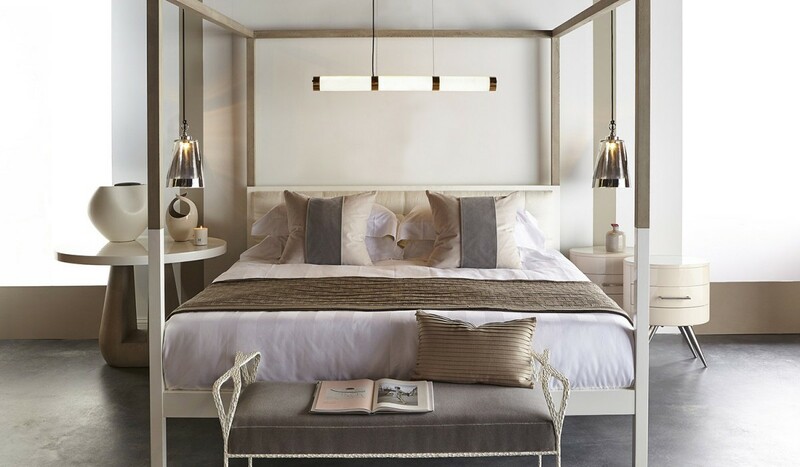 Shop the Kelly Hoppen Collection on the site here.